According to National Sample Survey Organization (NSSO), In 2009-10, estimated total number of domestic worker in India is around 2.52 million out of this 2/3 reside in urban areas and 57% of them are women. So in the last 10 years there is almost 75% increase in domestic workers mostly accounted for by women. Domestic work has historically been viewed as the realm of the woman with crucial household chores continuing to be either being unpaid (if performed by a household’s women) or underpaid (if outsourced to a domestic worker). Though Gujarat as a State is booming economically, the informal sector and amongst these, domestic work is still a sector where there is a lot of work that needs to be done. Their situation remains the same as for many across India – no bargaining power, no leave, no legal access, sexual harassment, over worked, and underpaid. Moreover there is no platform through which these women can come together to demand their rights. 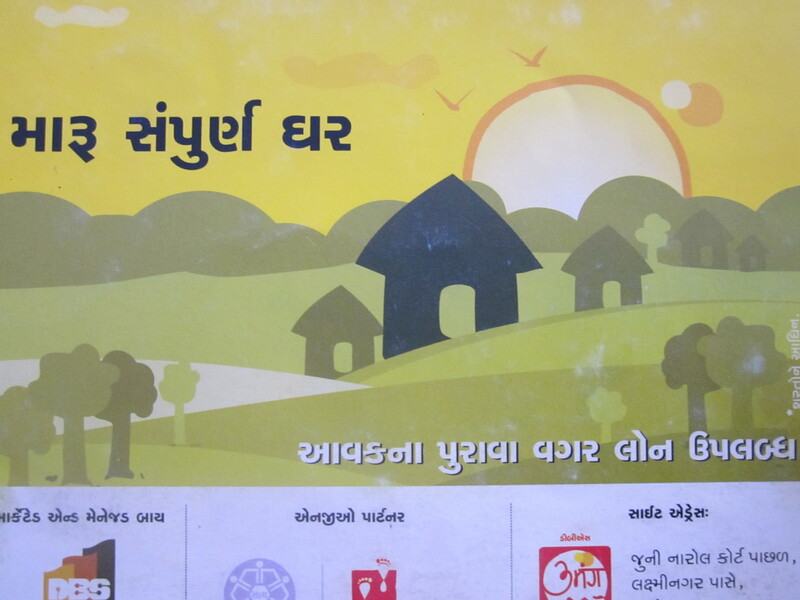 Saath’s Urmila Home Manager Programme attempts to bridge the gap between domestic servants and urban hous eholds. The main objective of the project is to empower slum residents from simply being “housemaids” to working professionals, Home Managers, with a significant increase in incomes, and to provide reliable, efficient and professional home managers for the clients. 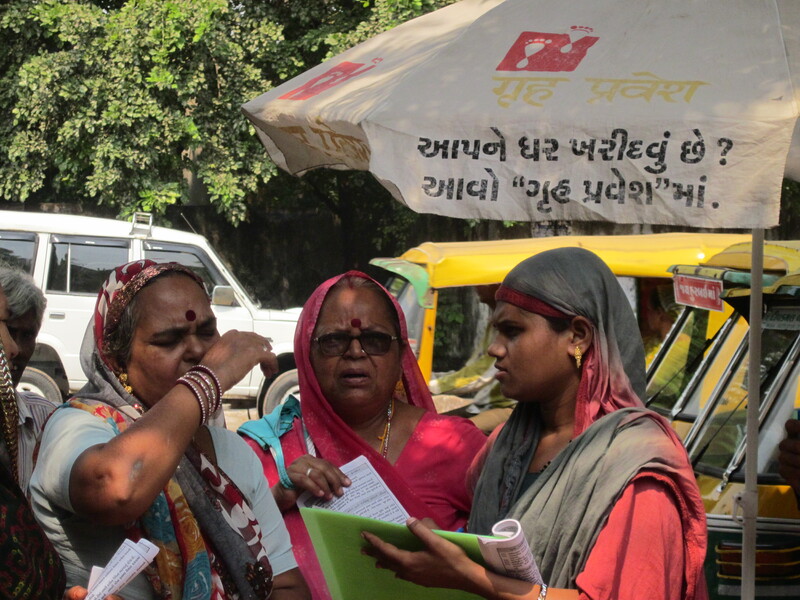 SAATH aims to develop a fair and formal platform to train and place women and men who work as house-help. We offer a reliable, efficient and professional domestic service, highly sought after by the households looking to employ domestic help. The programme also makes the clients aware of the rights and duties of the home manager, and vice versa. Further, it gives women from underprivileged households a sense of pride and achievement from the fact that they are now able providers to their families, they feel empowered. 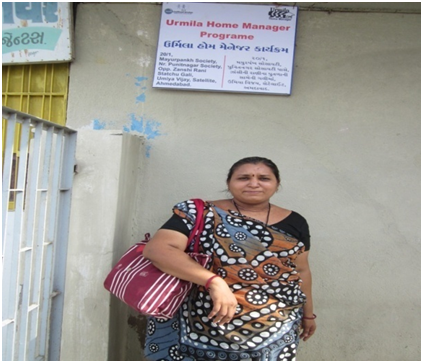 Rekhaben Manishbhai Solanki started working as Home Manager in the month of June. She has five members in her family, her husband, two daughters and a son. She has studied till 7th standard and is able to read and write. Her husband is working in the marketing field and earns only Rs. 5000 per month which is not enough money to fulfill the requirements of her family. She was looking for work to support her family. Her dream is to buy a loading rickshaw for her husband, so that he can work independently for their livelihood. 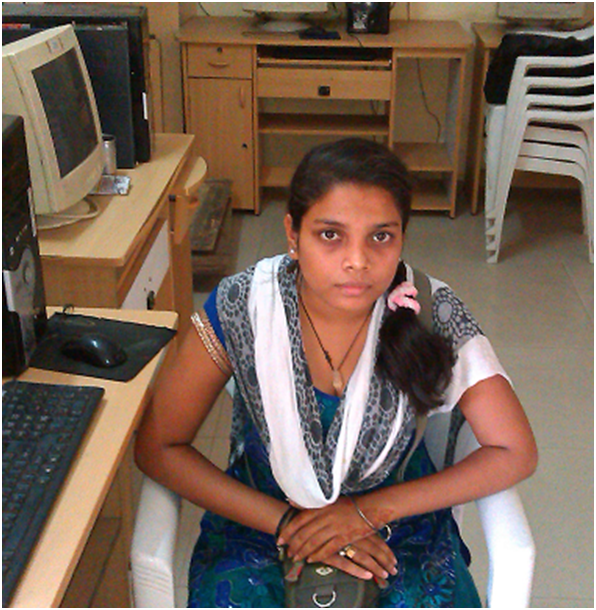 When she came to know about Urmila programme she immediately joined it and after completing the course she was placed. After finishing her household work in the morning she goes to her employers place. She works from 9:30 a.m. to 3:30 p.m and earns Rs.4500/- per month. Currently she is taking care of a 5 month old child. Mayuri Raval, 19, is a resident of Bapunagar, Ahmedabad and comes from a family of seven. Mayuri is a third year B.com student, studying at PD Pandya Commerce College and has to travel a distance of almost 10 Km daily to reach her college. Her father works at a textile finishing workshop while her elder brother is an estate agent (realtor). The monthly family income of Rs. 20,000 is enough to meet the demands of the family but it leaves no room for future savings or asset creation. Mayuri would return home from college at 12:00 and thus always had an ample amount of time left for other activities or for a part time job. She felt that instead of wasting her time she could utilize it and get a job and earn some extra money. Her elder sister who had witnessed one of the SAATH road shows suggested her to visit the UMEED Saraspur center. Mayuri visited the center and the trainers at the center gave her details about the courses offered, the timings, the charges of the program and other relevant details. Mayuri always had a keen interest in the nursing field however due to her mediocre performance at school level she was not able to pursue further education in the nursing field. She immediately enrolled her name for the BSPA – Bed Side Patient Assistance course at the center. The course timings of 1:30 to 5:30 were perfect for her as it meant that she did not have to miss out on her studies and also had ample amount of time left after the completion of the day’s lectures. She describes her experience as “The UMEED course acted as a turning point for me. It was an opportunity which I felt I had to grab. The first thing I learned at the center was that the main goal of a nurse should be to provide help to others, without thinking of any kind of personal gains. Along with training in the BSPA, I received training in spoken English, Basic Computers and Personality Development. To develop our social skills the trainers at the center conducted a number of activities on Saturdays which also gave me a chance to bond with my batch mates. On the completion of the course I got a job at Ashirwad hospital which is extremely near to my house and thus I do not have to waste my time on conveyance. I am able to balance my time between studies and the job and still have some time left for recreation. I hope to become a part of the Government nursing management programme in the near future”. This story was documented by Ishan Bhatt, who interned at Saath for a month. He visited the field and met with youth from the Umeed Groups. 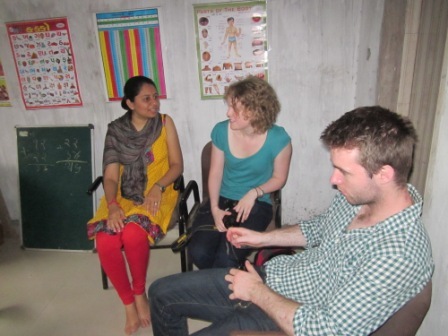 Last month in August two volunteers from Global Giving UK, Dan and Hannah visited Saath. They visited Saath on 12th August 2013 and stayed with us till 16th August. As per our earlier conversation, their main focus was Saath’s Education Programme “Child Friendly Spaces (CFS)” and help us in understanding and using the Global Giving portal more effectively to raise funds for our programmes on the portal. While in the beginning they were more focused on the CFS programme, but after getting to know about our different programmes, they showed interest in visiting our other education programme called Balghar. They visited one of our 7 Balghars in the Juhapura area and interacted with the children and our coordinator, Ms. Sanjidaben who is working with our organisation from last 11 years. They asked questions with an aim to get a thorough idea about Balghars and get field level workers’ focus and what encourages them to work for the community people. After that Dan and Hannah focused on the working of the CFS programme thoroughly. They took information Saath’s HR Policies, Account Policies, etc. They met the programme coordinator Mr. Niraj Jani. 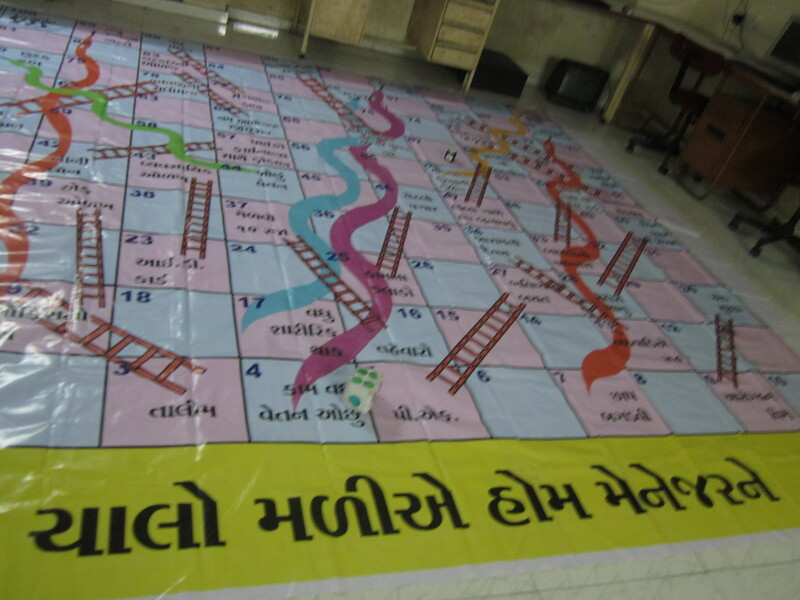 Dan and Hannah visited our construction site classes like Devnandan Suprememe – Vastral, Swaminarayan Park –Naroda and Umang Lambha classes and also 2 of our slum based classes situated at Khodiyarnagar area. They interacted with children by asking their experience at classes and also asked questions to the centre coordinators to know about their experience with Saath, how long they are working, what encourages them for working with these children, what is their main focus while teaching, what strategies are used while teaching to different age group of children, how many children are enrolled in formal education, how drop out children are contacted again etc. The visit has been really helpful to Saath and we are positive that now we will be able to effectively promote our programmes through Global Giving. Many thanks to Dan and Hannah and to Global Giving for sending them. If you want to see our Global Giving profile do click on the Global GIving link given on the top right side of the page beneath the calender. Approximately 86% of India’s urban population, constituting Base-of Pyramid, needs affordable homes today. Roughly 50 million units will be required by 2030. At present many of these people live in ‘informal settlements’ in rental or ownership accommodation where there is no security of tenure, civic services are poor and the home asset is not ‘mortgage-able’ in the formal space. This leads households into a vicious cycle of poverty. Numerous studies have proved that at least 2/3rd of people currently living in ‘informal homes’ can afford to buy a home in the, ‘slowly but steadily growing’, formal affordable housing market. A substantial portion of these people need assistance to navigate the complex process of home ownership. An entity that can work on a ‘social enterprise’ mode is therefore absolutely essential to provide this hand-holding. When I came from Madhya Pradesh to Ahmedabad, the sky above and the earth down were my residence. I started my business in Amraiwadi area where I used to sell clothes on the roadside and in the evening I used to sleep at the same place hence my the address of my business and home were the same. Slowly slowly I rented a house, but after every 11 months we had to vacate the house and find a new place. These time became stressful and also affected the education of my children and so finally I decided to buy a house of my own, it may be small but it will be in my name. I started searching for houses but I faced challenges because of pricing and loans. After some time it looked to me that I will never be able to buy my own house as I didn’t have enough documents for availing loan.